When we think London landmarks, none is more iconic than Buckingham Palace. Most of us across the pond know it as the scene of an occasional royal family reunion photo opp — we love seeing the royal waves from the balcony! — but the building actually has a fascinating history. It currently acts as a royal residence to the queen, is the administrative headquarters of the monarchy and has event spaces and state rooms for formal royal entertaining plus an art gallery. Dating back to 1703, the palace has been greatly enlarged from the original structure of a townhouse to its current form as we recognize it today over the course of the last 300-plus years. In that time, some intriguing facts have come to light. The sheer size and scope isn’t a huge surprise. You can certainly tell from photos that it isn’t exactly a quaint little cottage, but wrapping your head around the number of rooms inside is a whole other matter. Sometimes reported as 755 rooms, Buckingham Palace actually has even more than that: a whopping 775 rooms, including “19 State rooms, 52 Royal and guest bedrooms, 188 staff bedrooms, 92 offices and 78 bathrooms,” according to the most recent count. While Queen Elizabeth and Prince Philip are certainly the most obvious residents, other royals have their digs at Buckingham Palace too. Prince Andrew, Duke of York, resides on the second floor of the East Wing while in London, as do Prince Edward and his wife Sophie, the Earl and Countess of Wessex, and their children. Prince William and the Duchess of Cambridge live just down the road at Kensington Palace. Buckingham Palace has been the residence of the monarch since Queen Victoria moved in back in 1837, but that tradition could end with Queen Elizabeth. Rumor has it Charles has no intention of leaving his current home at Clarence House when he takes the throne, preferring to use BP for offices, official entertaining and ceremonial purposes only. The Queen takes great personal interest in the #ChinaStateVisit Banquet preparation – checking every detail, from the menu to the flowers. Planning a state banquet at Buckingham Palace can take well over a year, which is no surprise when you consider that just setting the table for the dinner can take up to five days! The table itself must be brought in and reassembled, table decor brought in, cleaned and placed, complicated place settings painstakingly laid out and double-checked with a ruler, flowers arranged, candles lit… you can read a little about the whole operation at the Buckingham Palace website. It must all pass the muster of the queen, who checks every minute detail herself. Seven. Times. Then-Princess Elizabeth and her sister, Princess Margaret, had been sent to Windsor Castle 20 miles away for safety, but one of these bombings came close to killing King George VI and Queen Elizabeth the Queen Mother when one detonated right outside their window. If you never wanted to leave Buckingham Palace, you really wouldn’t have to. In addition to its multiple residences for both royals and service staff, the palace has a swimming pool, a movie theater, a chapel, a post office, a doctor’s office fully equipped for surgery and a cafeteria. There’s even an ATM in the basement, but only the royals are allowed to use it. George VI use to keep 30 workers on staff just to keep all the candles lit in all the chandeliers in the palace, pre-electricity. The invention of light bulbs made that job considerably easier. Cleaning them is a different story. Some genius arranged it so that the fixtures can now be lowered from the ceiling via remote control, but they do still need to be hand-cleaned, crystal by crystal. The River Tyburn once supplied drinking water to parts of London centuries ago before being converted to a sewer. Now mostly contained in a brick tunnel, it still runs underneath the courtyard on the southern end of the grounds, and some say underneath a portion of the building. 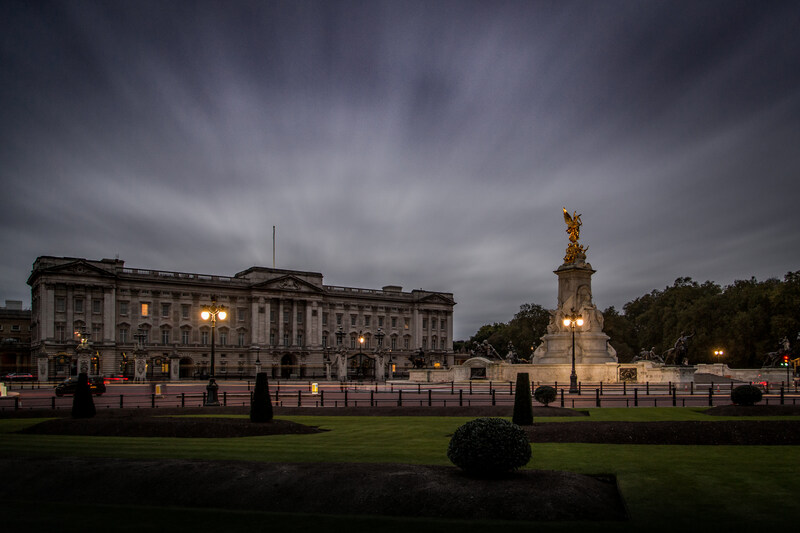 Buckingham Palace is reportedly home to two ghostly figures, a monk and a major. Centuries ago, a monastery stood on what is now palace grounds, and it is said that a monk in a brown cowl paces the rear terrace at night. King Edward VII’s private secretary is still hanging around too. Unable to bear being shunned by upper-class society after his divorce, Major John Gwynne shot himself in his office on the first floor — and his spirit is still seen today.